One of your ancestors fought alongside Davy Crockett at the Alamo, and you’ve entered that information into your RootsMagic database. Unfortunately you don’t remember which ancestor it was, or how to easily find him. 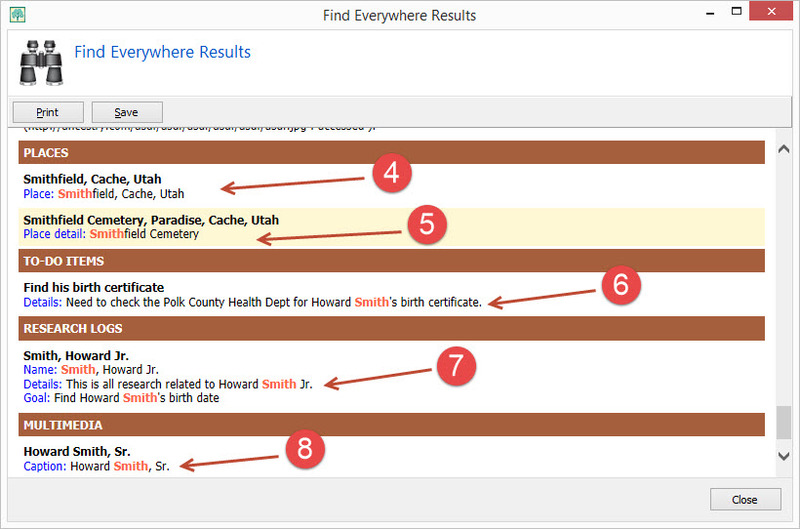 Luckily, RootsMagic makes it easy to find anything, anywhere in your database with Find Everywhere. Find Everywhere does exactly what it sounds like. You enter some text, and RootsMagic will display a list of everywhere in your database that text is found: people, names, places, notes, sources, citations, media, to-do items, research logs, and more. 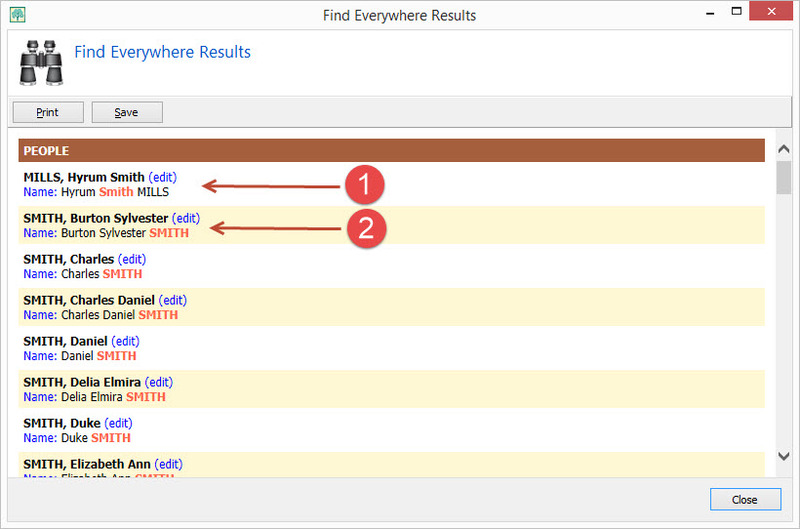 Just do Search > Find Everywhere from the RootsMagic menu and the following form will open. You can search for a single word or phrase by just typing it into the first field. Or you can search for a combination of words / phrases by entering them into separate fields and using the And/Or options. You can also choose whether you want the results to match by case also. For example, if you mark “Match case”, then “Smith” and “smith” will not match. 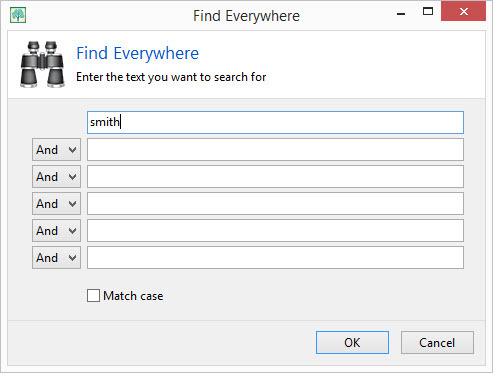 Click OK and RootsMagic will return a list of every place your desired text is found (in our example, the word “smith”). 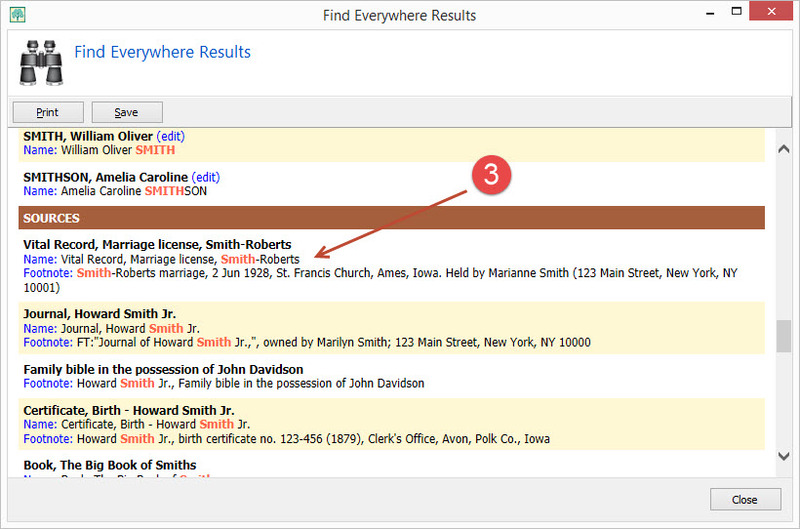 Here we can see that it found a number of people with the name smith, whether 1) as a given name, or 2) as a surname. It will also show you if any person notes have the word “smith” in them also. As we scroll down the list we can see that Find Everywhere returned sources with the word “smith” in them as well. 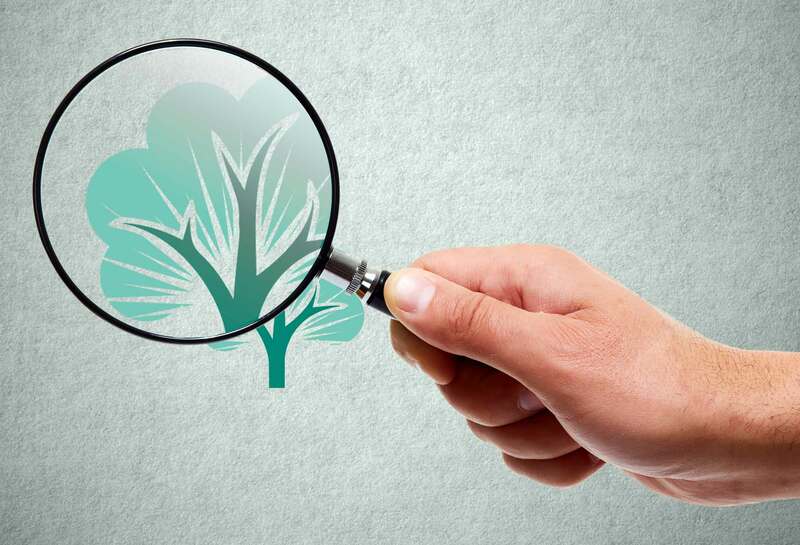 It doesn’t matter if the desired text is in the name, footnote, bibliography, research notes, etc., RootsMagic will find it. Scroll down even more and we see 4) places, 5) place details, 6) to-do items, 7) research logs, and 8) media items with the desired text. And best of all, notice how every result has a blue title. That title is a link you can click on to directly edit that piece of information directly from the Find Everywhere results. And of course you can also print or save the results using those buttons on the results page. So the next time you can’t remember where you put that little tidbit about an ancestor, let Find Everywhere do the dirty work for you. LOVE these short, concise tips! Quick & easy to read, understand & remember. I also appreciate them showing up in my Facebook feed, so I never miss anything. Good work & many thanks, Bruce & the rest of the RM gang! What a powerful tool…how many time have I wished I could do just this. Thanks so much for pointing out this remarkable search tool. I got through using it and is a nifty little tool. With fairly large databases, it takes awhile. I found a couple of errors and corrected them. Thanks so much for that little tip. Have never really used that. I have Family Tree right now. It’s really good but I’m always eager to check out other sites too. I need allof the info I can get. That was terrific! I just typed in pioneer to see what it did. I got so many matches of my pioneer families. Now when I need to look up one person or event it will be so easy. Just yesterday I was looking for someone and it took me a very long time to find what I was looking for. Thanks for the clue about finding anything! Used this feature many, many times, and it makes the find so very easy. Very pleased also with these additional tips. I really enjoy your little tips keep them up!